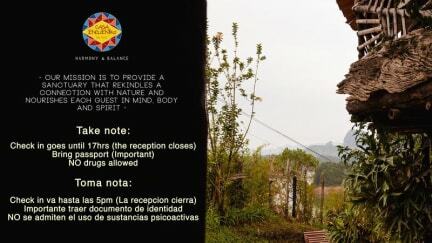 Casa Encuentro Hostel was born from the deep desire to enrich a sacred space that connects man with nature through relaxation practices, interaction with art, landscape and dining experiences. Casa Encuentro by Haus opens its doors to all of our fellow travelers who appreciate and enjoy the nurturing balance of nature, music, art and gourmet dining in a single place. 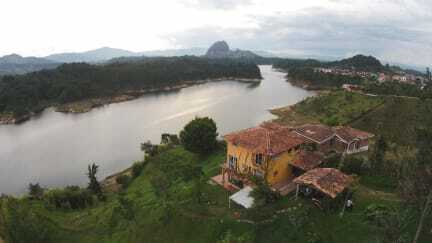 Located within a mere 10-minute walking distance from the picturesque town of Guatapé, Colombia, Casa Encuentro hostel is a charming farmhouse with private access to the breathtaking, lake-looking Guatapé. Our rooms are warm and cozy, with avant-garde artistic touches. Casa Encuentro creates a peaceful and healthy environment that seeks to show what Colombia is all about: unique, colorful and welcoming. A 10 min du centre à pieds. Vue magnifique sur le lac. petit déjeuner fabuleux. Un bémol ( si s en est un) : la connexion wifi.